When your father is a legendary two time, two division World Boxing Champion, there’s bound to be a lot of expectation that Steve Collins Jr. would follow in his father’s footsteps and embark on a professional Boxing career. However, things don’t always go the way you would expect. From an early age Steve showed sporting prowess in a very different discipline – Rugby. Young Steve started playing Rugby when he was seven years of age. During his Rugby Career the 23 year old from Dublin played at all club levels and is currently playing for one of the best known clubs around, the 2012/2013 All Ireland Champions, Lansdowne. 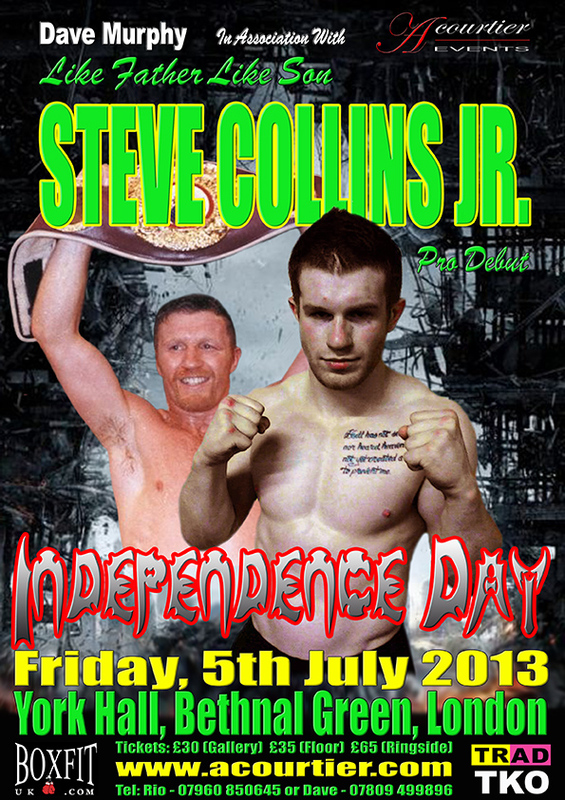 Well, eventually young Steve did decide to take up the noble art and is now due to debut on the Dave Murphy, in association with Acourtier Events, promoted ‘Independence Day’ extravaganza at York Hall in London on Friday 5th July. Speaking on the phone for his Dublin home earlier, Steve said of his impending pro boxing debut. “I feel good and must say I’m very excited about my boxing debut on the 5th July. I’ve done all the hard work, my training and sparring has been top class, so I know I’m more than ready. I know there’s a bit more pressure on me to perform really well, as everyone expects me to be a decent fighter because I’m my father’s son, you know. I don’t mind that at all, it gives me more to fight for. I think it’s going to go well, I have a fight plan in my head and obviously think I’m going to win, but really what matters is that I fight well and give the fans something to cheer for, hopefully there’ll be a good Irish crowd at York Hall to cheer me on. Steve Collins Jr. versus Rolandas Cesna, features on the undercard of the Jennifer Rezke - Angel McKenzie World Championship clash, that headlines the Dave Murphy, in association with Acourtier Events, promoted ‘Independence Day’ event, which takes place at York Hall in Bethnal Green, London, on Friday 5th July 2013. Tickets, priced £30 (Gallery), £35 (Ground floor standard seated) and £65 (Ringside) are available on-line at www.tkoboxoffice.com - www.mariannemarston.com - www.acourtier.com - or in person from the TRAD TKO Boxing Gym in Canning town – www.tkoboxinggym.com - and Ringtone Gym in Euston - www.ringtonehealthandfitness.com - or from any of the boxers taking part in the event, or call – 07960 850645, 07809 499896 or 07557 641597 for further information.